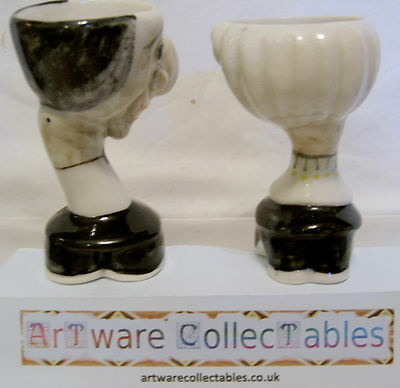 This is one of the most difficult to find Eggcup Sets produced by Roger Michell of Lustre Pottery but, fortunately, we have a couple of them to offer. This particular Set without Baby, is one of the very early editions, being, in fact, No.1 and, to date, I haven't come across any others. Unlike the complete Sets which have been produced for the 350th. Anniversary of Mr. Punch and his put-upon family, this one is not part of these celebrations, though it is typically interesting enough in its own right. 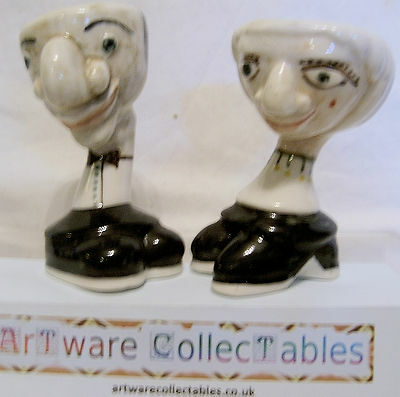 The set comprises just Mr. Punch and his wife, Judy. This one-off set was decorated in the Lustre Pottery studio with a one-off colourway. There is no crazing at all and there are no chips/nibbles nor restoration work. The height of Mr. Punch is 3.75 inches (9.5 cms). 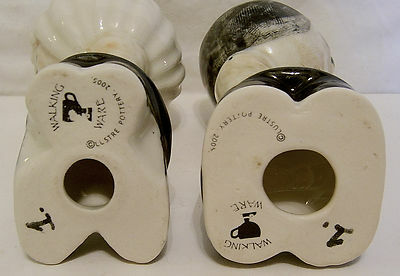 Each piece is backstamped showing the Walking Ware logo and the No.1 designation and dated 2005.